Do Indian Sterotypes Reflect Reality? A stereotype is a popular belief or generalization about something. And, let's face it, India attracts a lot of stereotypes, much to the annoyance of its citizens. Yet, India truly is a country of contrasts and contradictions. It's often said about India that where something is true, the opposite will also be true. Let's take a look at 15 popular Indian stereotypes and see how much they reflect reality. Snake charmers conjure up images of the ancient and exotic for tourists, but are a bane for the average Indian who feels that they portray the country in a backwards light. The reality is that snake charming is illegal in India and has been for a number of years, although snake charmers do still exist. What's more snake charming has never been prevalent all over India. It was mainly practiced in Rajasthan by the nomadic Kalbeliya tribe, a snake charmer caste. Of course, there's so much more to India than snake charming! Slums, slums, everywhere! The movie Slumdog Millionaire had a huge impact on the way India was perceived around the world. The amount of beggars in India doesn't help the situation either. But what usually strikes foreigner visitors is that although many people in India have very few possessions, they still smile. Indeed, there is a lot of poverty in India. However, India also holds a significant proportion of the world's riches. Some of the richest people in the world live in India. In addition, the disposable income of the "great Indian middle class" is now increasing. As a result, people are becoming more materialistic, and concerned about status and appearance. Many foreign tourists come to India looking to have what they term a "real India experience". They like to live as frugally as possible, and delve into India's dirt and chaos. They overlook the fact that India has luxury hotels, shopping malls, nightclubs and bars -- which are also part of the country's fabric. Instead of the "real India", a more accurate term would be the "dual India". Indians Speak Hindu -- oh, um, Hindi! Unfortunately, many foreigners make the mistake of confusing religion with language in India. Hindu is the religion, and Hindi is the language -- but you may be surprised to find that many Indians don't actually speak Hindi. This is particularly the case in south India, where they speak languages of Dravidian origin. In fact, Hindi isn't even taught in many schools. Every region in India has its own language. Hindi is spoken in its purest form in north India. It will be a second language to many people elsewhere in India, and English is widely spoken across the country. This is probably the worst and most inaccurate stereotype -- that Indians aren't educated (they drive taxis and work in 7-Eleven stores). The truth is that education is extremely important in India. Even poor village families strive to give their children the best education possible because they know it's the key to a better future. Doctors and engineers top the list of professions in India. MBAs and PhDs are common qualifications. India also has plenty of business schools, and the government is working hard on providing quality higher education. The education system in India is competitive and challenging, and children are given exams from a young age. Children commonly go to extra tuition after school just to get ahead, especially in big cities. One of the first things that usually comes to mind when people think of India is holy cows. They've got quite a reputation. And the question that's often asked is, "Do cows really roam on the roads even in cities in India?" This stereotype is actually true. It won't take you long to spot your first cow. They can even be found chilling on the beaches in Goa! Cows wandering the streets do pose a problem though. They will fearlessly walk out in front of traffic, so drivers need to be extra cautious. While the Punjabi cuisine served in Indian restaurants across the world sure is tasty and popular, it's not an accurate representation of what Indian food really is. In fact, each region in India has its own style of cooking. And, not all of it is spicy either! In Kerala, the use of coconut is popular. In Kolkata, the menu commonly features seafood such as fish or prawns. Down south, rice is favored. In the north, people prefer Indian bread such as naan cooked in the tandoor. 330 million gods in India! Gods and goddesses with multiple heads and arms! What kind of crazy religion is Hinduism? Actually, it's not what it seems. While Hindus do believe that god is in everything, it's all manifestations of the one source and creator of reality -- Brahman. Therefore every living and non-living thing is viewed as sacred. Each of Hinduism's many gods and goddesses also represent individual aspects of Brahman. For example, Ganesh is worshiped for good fortune and removing obstacles. Hinduism doesn't prescribe any set path. Rather followers can worship which ever deity they feel the need to. 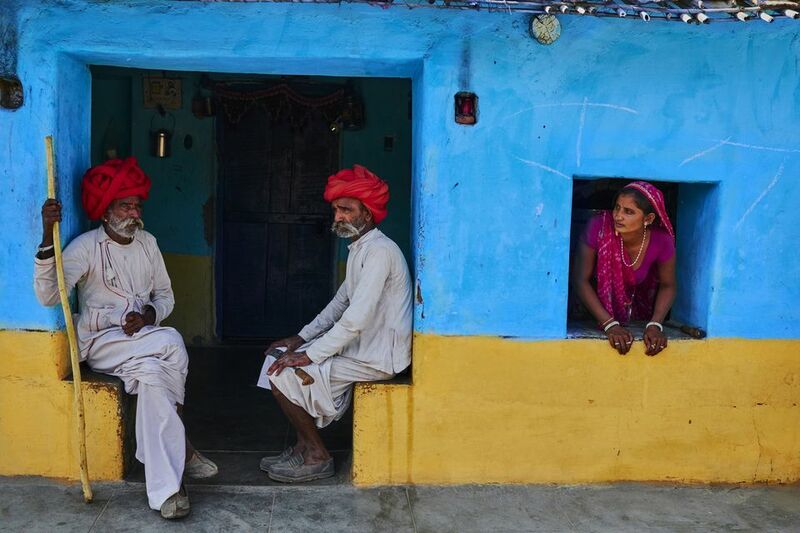 The rigid caste system that India has been known for in the past is slowly changing. It's existed since the Vedic Age, but it was during British rule that Indians were especially categorized according to caste. When India achieved Independence, the government wanted to build a casteless society. Education has played a huge role in changing the caste system. Nowadays, you can't just assume someone will follow a certain profession just because of his surname. Even lower caste people are studying to become engineers. However, caste still remains a significant part of people's mentalities, particularly where arranged marriages are concerned. Conversations among Indians also include jokes that refer to caste stereotypes. Unfortunately, corruption is a major concern in India. The problem grew in the years after India became Independent, and started from the top level of government. Without proper legislation in place to penalize it, it proliferated. Bureaucrats followed the lead of ministers, and citizens had no choice but to comply with it in order to get any work done. Hence it's spread through all levels of government and society. However, the public's tolerance for corruption has reached an all time low. There are growing political movements against corruption and a number of measures are being put in place to curb it. The saree (or sari) is traditionally worn by women in India and is a cultural icon. It's undoubtedly timeless and elegant. However, not every Indian outfit is a saree! Indian women wear other types of outfits, both casually and formally. The salwar kameez (loose pants and tunic top, with scarf) is popular for everyday wear, especially in north India. Lehengas (long embellished skirts and crop tops, with scarf) are also replacing sarees as popular wedding attire in the north. These days, most young Indian women dress in western clothes, to the extent that those who are unmarried and wear sarees really don't fit in. In large cities, you'll often see young women wearing tight tops and skimpy dresses when partying at bars and clubs. Many Indian women choose to casually wear jeans and a kurta (a traditional tunic top), blending both Indian and western fashion. The growth in New Age spirituality in the West has brought about a corresponding interest (and fascination) in the spiritual side of India. Many foreigners think of India as a spiritual mecca with a mystical culture. Yet, the yoga widely practiced in the West is different to the centuries-old tradition that is practiced in India. What's more, not everyone in India incorporates yoga into their daily lives. While namaste is integral to Indian culture, it's no longer a universal greeting in modern Indian society. These days, in urban areas, it's usually reserved for formal situations and interaction with elders. It's most common in regions where pure Hindi is spoken and is less relevant where Hindi is not the first language (such as in south India). The infamous "Big Fat Indian Wedding" goes on for days with much feasting, singing and dancing, and a groom who arrives with fanfare on horseback. It's designed to be a display of wealth and social status. In reality, not all Indian weddings are like this though. Just like food and language, different states and communities have their own wedding rituals. Large ostentatious weddings are much more common in north Indian states, such as Punjab, than in the south. In Kerala, for example, wedding ceremonies are quick and quiet affairs -- so much so, that they're done in 15 minutes! And, they usually take place without the sangeet (celebratory night of dancing and partying before the wedding ceremony) and mehendi (application of henna to the bride's hands and feet) events that are important parts of north Indian weddings. (However, that's not to say wealth isn't shown. Brides in Kerala are traditionally heavily adorned with gold jewelry). Certain disorderly behaviors, such as cutting in line and throwing garbage everywhere, can create the impression of Indians being uncivilized. Undoubtedly, there are differing standards of etiquette in India compared to the West. This stems from the past, when standards of living were poorer and resources scarcer. Life was a daily struggle, and still is for many people. In addition, Indians are used to having others clean up after them. The mindset is that someone (perhaps a scavenger) will eventually pick up the garbage or burn it. However, awareness is growing and people are changing the way they behave. In the process, they're becoming less tolerant of those who lack basic etiquette. The concept of arranged marriage in India may be difficult for foreigners to understand. India has evolved but these marriages undeniably remain the norm. Yet, the way they happen is usually different to the widespread perception about them. There's a notion that arranged marriages are forced, the couple meet for the first time at the wedding, or they involve child brides. However, many people readily choose to have arranged marriages, as it's a convenient way of finding a compatible partner when they want to settle down. Not all arranged marriages involve advertisements for brides or grooms on dating sites or in newspapers. Often, they're as innocuous as friends or family members recommending someone (which isn't that different to a blind date). In the modern arranged marriage, the potential couple spend time getting to know each other before agreeing to go ahead with the marriage. Rejections are common. Not everyone marries the first person they see!